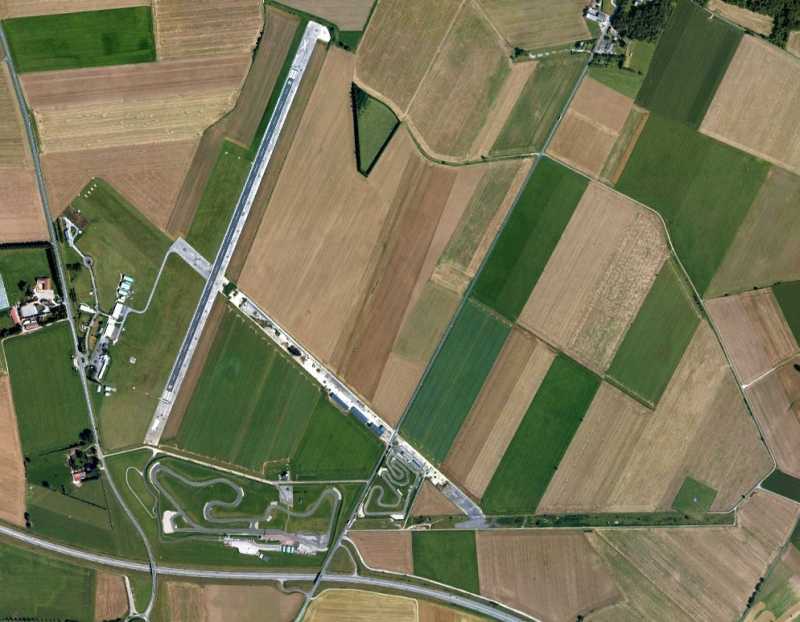 Abbeville airfield (french: Aérodrome d'Abbeville - Buigny-Saint-Maclou, also known as Abbeville/Ducrat or Advanced Landing Ground B-92 Abbeville, ICAO: LFOI) is an airfield 150 kilometers north-northwest of Paris, France. It is not known when exactly the airfield was built, but it already existed in 1939 and it was in use with the British Expeditionary Forces in 1940. Detachments of 607 Squadron with Gloster Gladiators were based here, along with 151 Squadron Hurricanes, before they were withdrawn to English bases in June 1940. 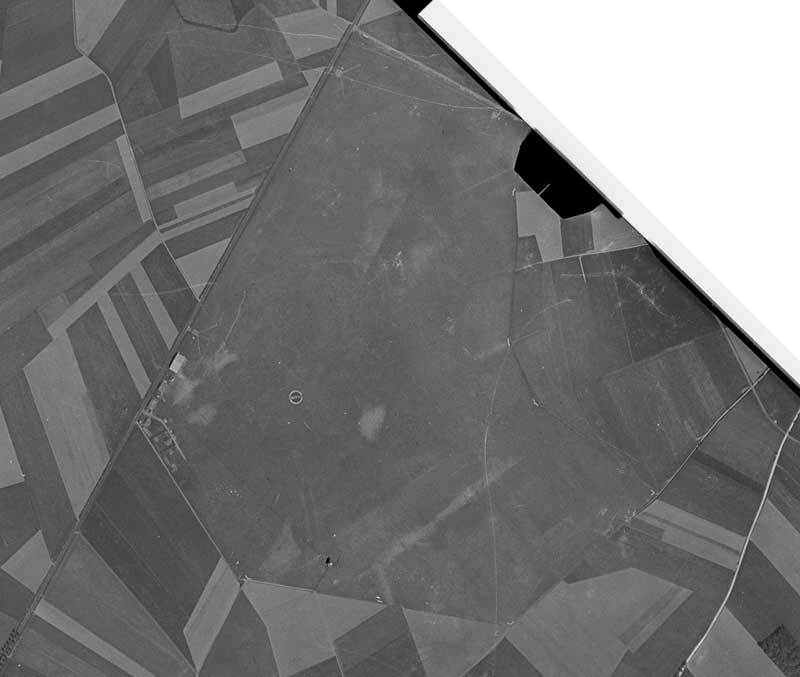 Detail of an aerial photo of Abbeville airfield on 5 June 1939. 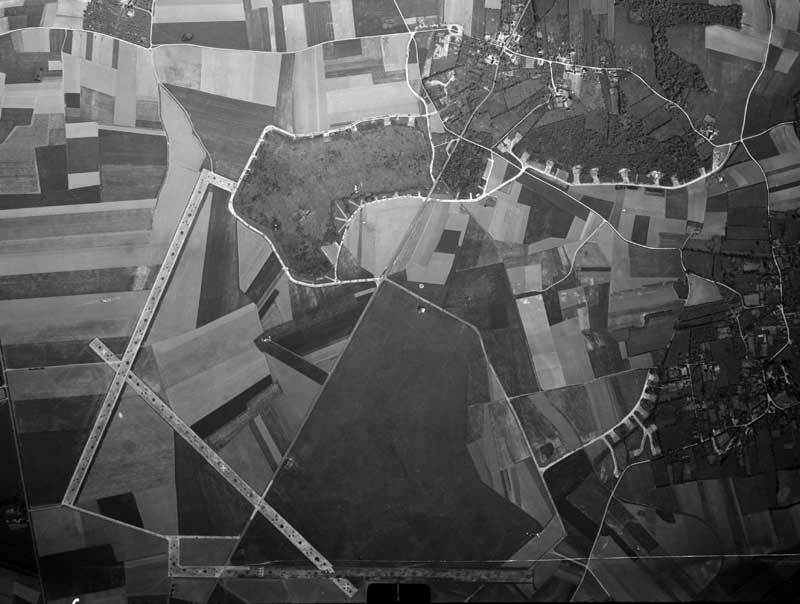 Back then, the entire airfield was located east of the road between Abbeville and Le Plessiel. Visible are three hangars and a circle with the name ABBEVILLE spelled across (IGN.fr). After the Battle of France the Luftwaffe moved Zerstörergeschwader76 (ZG76) 'Schlageter' with Bf110Cs onto the airfield, along with Fw190As of Jagdgeschwaders JG26. It was the Luftwaffe that upgraded the airfield with three concrete runways in the configuration that we can still see today. It is unclear when exactly this occurred though. The airfield was a major German fighter base between 1940 and 1943 with over 50 aircraft based here. JG26 gained a considerable reputation with Allied pilots, who referred to the yellow nosed Bf109s as the "Abbeville Boys", although JG26 were never permanently present at the base. Instead the Gruppen and Staffeln of the Geschwader moved from base to base throughout occupied Europe and used Abbeville only as their home base. Fom 1941 the first two Gruppen of JG26 converted to the Fw190D. III./JG26 began conversion, but converted back and remained with the Bf109 until the end of the war. Abbeville was liberated by Free Polish troops around 3 September 1944. Days before German sappers had blown up much of the airfield to prevent it from falling into Allied hands undamaged. Soon after te liberation repairs to the damage to the airfield were made. The airfield was only sparcely used however. Only by March 1945 did a new unit arrive: 61st Troop Carrier Group (USAAF), who remained at the airfield until May. They never brought their C-47 Skytrain squadrons to the airfield though, as those were needed in England in preparation for Operation Varsity. It did provide services in the European theatre, hauling fuel, ammunition, food, medicine and other supplies, as well as performing Medevac flights. Most sources claim that after the war the airfield was abandoned. IGN photography from 1947 does not support that claim, however. Although they show X markings on parts of the runways, they also show new threshold markers on other parts. As 1952 photos showed a communications board that was not present in 1947 photos, it is unclear if or when the airfield did close. 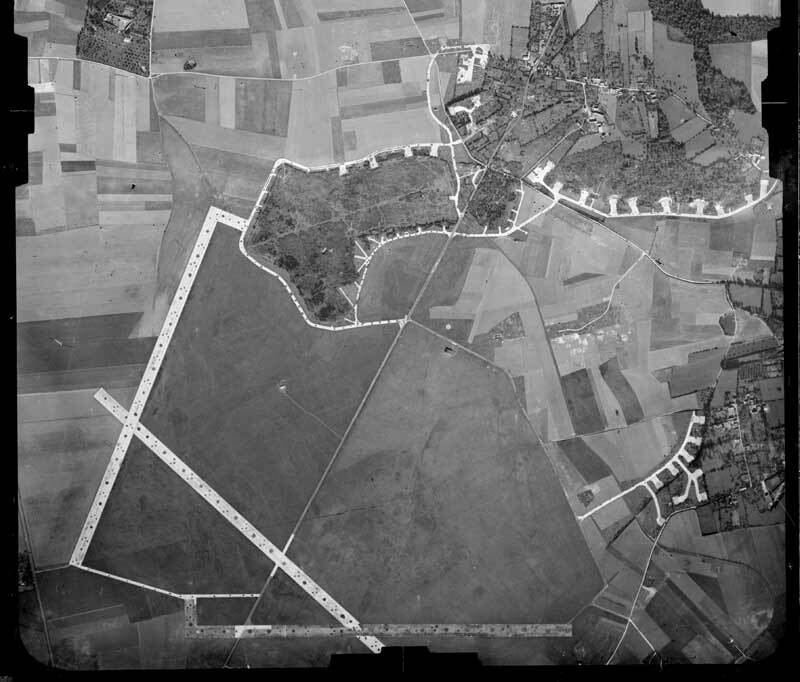 Abbeville airfield in October 1947, showing the considerable upgrades the Germans had made to the once very modest airfield. 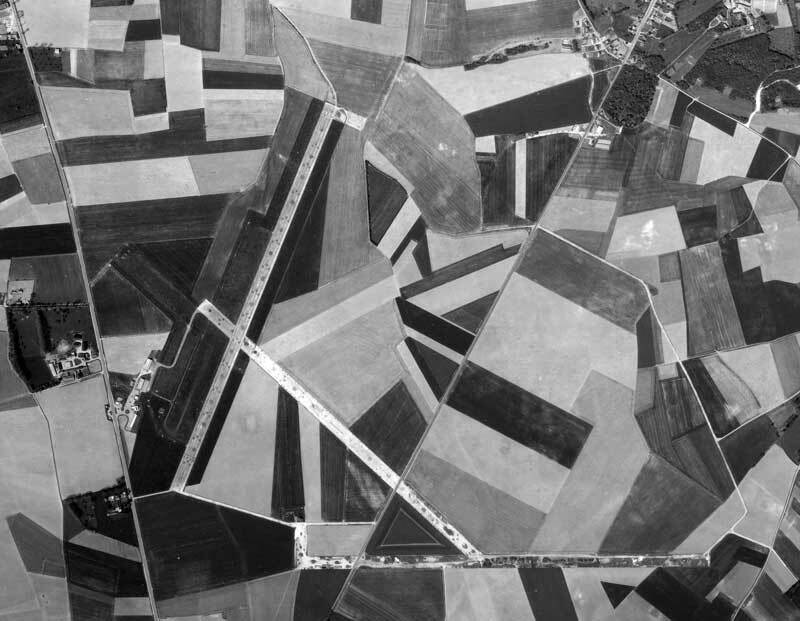 Also clear is the regular pattern in the runways which proves that the damage to the runways in 1944 was preplanned (IGN). Overview of Abbeville airfield April 1952. Two hangars can be seen near the grass field that was Abbeville aerodrome before 1940. Also visible (in the original large photo) is a communications board northwest of the 09 threshold, and large X-markings on the 13/31 runway and on a 400m stretch of the west side of the 09/27 runway. The 02/20 is not marked with any X's, suggesting it is still open (IGN). In 1971 the old grass Abbeville flying field had been moved to the west side of the former German Fliegerhorst. Instead of a grass flying field, the airfield got two grass runways and a single long concrete runway (02/20). 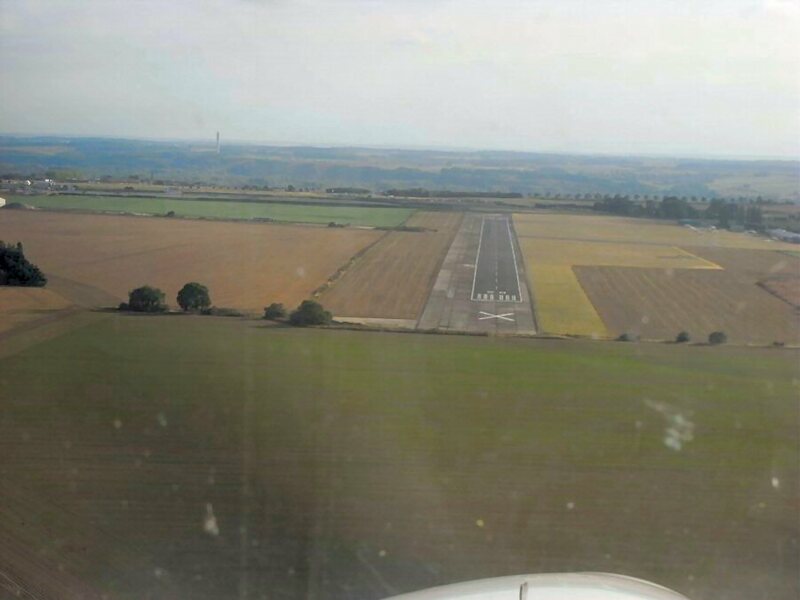 Although the X was removed from the 13/31 runway-head, this was only done so it would not prevent the use of the grass 02/20 runway. The rest of the runway was by this time located outside the airfield, as was the 09/27 runway, which is getting overgrown. The wartime fighter dispersals have almost completely disappeared (IGN). Today most of the airfield has been converted for other uses. Its former three runways are still recognisable from the air, but only one remains (partially) in use. While the east-west runway has almost completely been overgrown (or even removed), the former 13/31 concrete runway is still largely intact, although several buildings have been placed on it. Only the 02/20 runway is still fully visible, although a newer but smaller asphalt runway has been laid out on its surface. Two smaller grass runways compensate for the loss of the larger concrete runways. One building at the airfield appears to have been from World War II and remains in use. A preserved ex-Adl'A Mystère stands on a pole next to the entrance of the airfield. Overview of Abbeville airfield in 2007 (Google Earth). 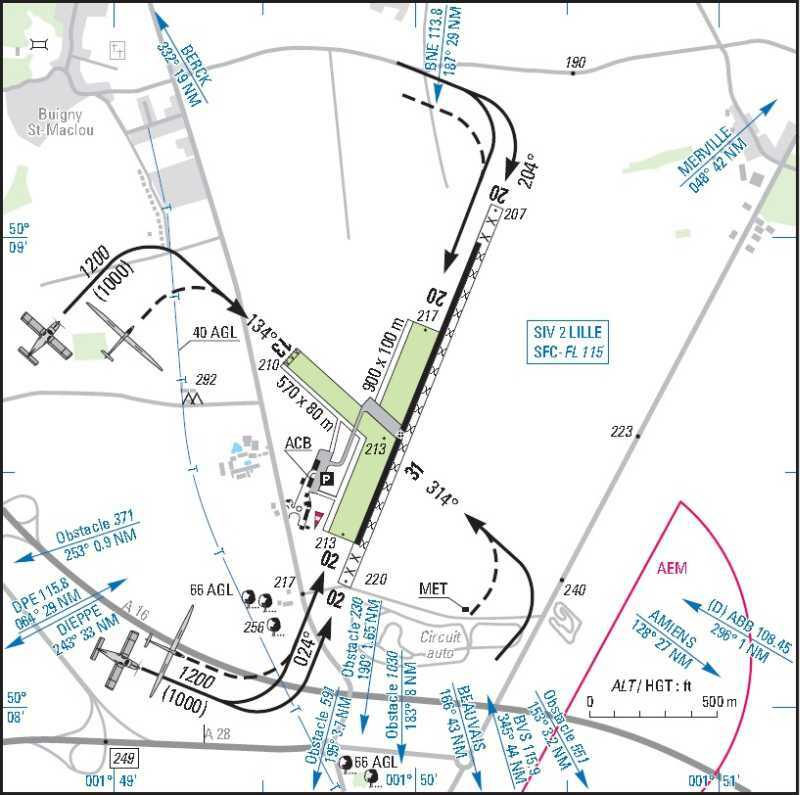 Approach to runway 20 in Aug 2009 (gsaviation.co.uk). Approach to runway 02 (microlightlife.blogspot.com). 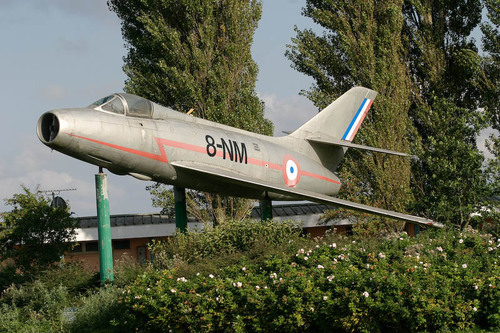 The preserved Mystère fighter near Abbevilles entrance. 2011 Abbeville visual approach chart.